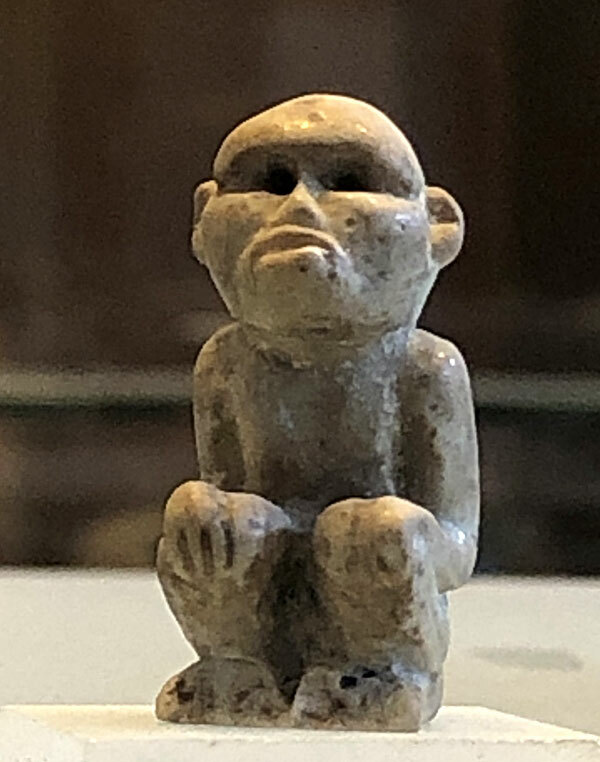 Of all the objects in the National Museum of Pakistan's Indus Gallery in Karachi, none quite so grabs your attention with its innate character as this tiny faience monkey from Mohenjo-daro. Just over 3 cm in height, made of blue-green faience, probably in a wooden mold according to Mark Kenoyer (Ancient Cities, p. 230), it arrests you with the richness of its persona through the glass casing. It seems to have its character pushed from the inside out, so regal is it in the surrounding space. Broken feet suggest it might have once been part of a triple monkey figurine. John Marshall wrote "The monkey is now extinct in Sind, but that it existed there in ancient times is suggested by the fact that models of it are found in Mohenjo-daro made in faience, pottery, and steatite. It is always represented in a squatting position with a hand on each knee." (Marshall 1931: 349, 351, pl. XCVI, 13).